The love story known to all, written in a different way. Rukmini Harana, presented the way I visualise it to be. This story is my interpretation of an event well known, my perception. I am well aware of how the Bhagavatham portrays Rajkumar Rukmi, yet I chose to portray him the way I have. "The time for your Swayamvara has come near, my darling. In two weeks, you will choose the man you want to marry, and will live happily with him. Are you ready for it, Rukmini? Rukmini had shyly muttered yes, her mind on the beautiful face of Krishna, the Yadava chieftain Vasudeva's son. He had been the King of her heart since she was a mere four year old. The day that her father had received a beautiful painting of Krishna, the very same day she had fallen in love with Him, her heart proclaiming Him to be the greatest of all men, and the most beautiful as well. Hearing the miracles He has performed only increased her love for Him. She knew He was God, but He will always be her Lord before being her God. "Dwarakadheesha! I only want to rest at your Lotus feet, oh Lotus-eyed One! Won't you grant your Rukmini that? Have I not worshiped you in all ways possible my Lord? Why have you not come yet, Yadunandan? Rukmini laid her head on her bed, seating herself on the floor, her mind drifting to the dreams she had had of late; the ones of Dwarakadheesh and another young woman, who from a distance looked exactly like her. It was as if the only difference was the slightly fairer golden skin the other woman was. Rukmini felt a connection to her, and she could feel that the maiden was as much in love with Yadava Krishna as she was. Sighing, she closed her eyes, concentrating on the enigmatic son of Devaki, her heart thumping ridiculously loud in her chest. Rukmini blinked at her eldest brother Rukmi. How was this even possible? Her brother, her darling elder brother, who made things for her without asking, who bought whatever he wanted for her, simply to make her smile, who loved her with his entire heart, was doing this to her? It was impossible. Her Rukmi Bhaiya would never force such a horrible situation on her. He cannot do this to her. Her mind drifted back to her childhood days, when she was a little six year old. Rukmini giggled as she ran out of her vast chambers, hearing the sound of her elder brother's chariot being pulled to a stop. Her Rukmi Bhaiya had come! Rukmini's melodious, childish voice rang across the chambers, where Rukmi was greeting his parents. Rukmini giggled when Rukmi lifted her in his arms and swung her around, laughing joyously. Rukmini had missed her elder brother, and she brought her arms around his neck, hugging him tightly. "I got something for you! Or rather, made something for you! Rukmi had led the joyously happy Rukmini to his chariot, to show her the beautiful wooden elephant he had made for her. "Bhaiya, you can't do this to me. I love Vaasudeva Krishna. "That doesn't matter. You have to marry Sishupala, little sister. There is no choice here, said Rukmi, suddenly growing weary. "What did they do to you Bhratr? asked Rukmini, her eyes narrowing. "No Bhratr, tell me! said Rukmini, her voice now steely, her words more of a command, though said respectfully. Rukmi looked at his sister, and suddenly saw a beautiful light surrounding his sister, giving off a Divine aura. Realising what his heart had known all along, he nodded his head. "They threatened Pitashree's life if I did not make you marry Sishupala, said Rukmi, fighting tears. "I see. Then let us retaliate, said Rukmini, softly. "Strengthen security around Pitashree Bhratr, while I do what I must, to prevent this tragedy from happening. "Tragedy? Rukmini, it is marriage. "To Sishupala, which is a tragedy, believe me. Did you know that he is not lusting after only me, but also after a Yadu Kanya called Satyabhama? He wants to marry both of us. For what? To satisfy his lust? That is not a man Bhratr. Not a true man. You know very well. You married Bhabhi because you loved her, and more importantly, she loved you back. "Why? Is it because our father's life is being threatened? Then work to protecting him Bhratr, not trying to convince me. I will not marry that jackal of a Sishupala, not when my heart and Soul already have a Lord in Vaasudeva. It is my marriage, but it is more Bhrata. It is a life choice, it is for Eternity. Bhratr, a woman is allowed her choice. That is the meaning of Swayamvara. How can I choose one despite knowing that I love another? questioned Rukmini, her eyes shining brightly. "I know, said Rukmi, tiredly. "What do you want to do? "Protect Pitashree, Bhaiya. I will take care of not marrying Sishupala, said Rukmini, now smiling. "How will you, my darling sister? "Why, by writing, of course! Rukmini gently caressed the pigeon she was feeding, her mind trying to find the right words. She felt frustrated, as her mind was a complete jumble, and she had no idea how to write what she wanted. "Writing from the heart conveys one's emotions, putri Rukmini, said Raja Bhishmaka, smiling at her lovingly. "Whatever you write, write from your heart. When you do so, your words will flow like an unstoppable river. 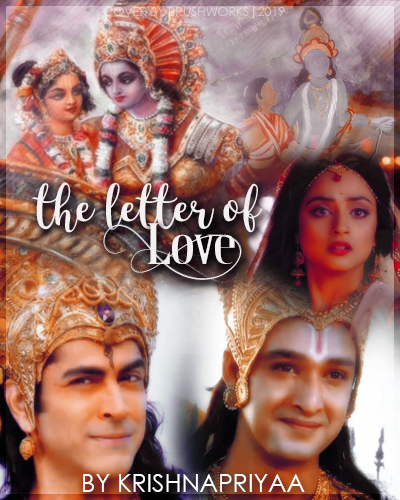 With a wide smile, Rukmini quickly took a quill, and channelling her heart and soul on the parchment, she began to write, a blush forming on her face. Rukmini looked over her palace balcony, as she watched the Brahmin to whom she had entrusted her letter to. Closing her eyes in prayer, she requested Krishna to come for her, quickly, so that she may be far away from the prison that was her home. "I will come, my love. How can I not come for such loving calls? I will come, as soon as possible. Or rather, the moment I read your letter. For despite knowing what is in there, reading such beautiful, love-laden words will always fill my heart with utmost pleasure. Saying thus, Krishna looked towards the direction of the West Gate, from which the Brahmana Rukmini had sent would be coming. It feels blissful, reading this story of eternal love in your words, Bunnu! It is beautifully written. Looking forward to the rest of it. A well- written part, Krishna. You set the stage for the romantic interlude for Rukmini and Krishna wedding. Looking forward to reading further.